Grand Prize: Holiday Package to Gold Coast, Australia worth RM20,000. Top Prize x25: a Branded Selfie Camera worth RM1,500 [Ringgit Malaysia One Thousand Five Hundred] each. Consolation Prize x200: a Branded Instant Photo Camera worth RM300 [Ringgit Malaysia Three Hundred] each. Snap a photo of you or your friends with Nestlé Ice Cream. Tell Nestlé Malaysia in 100 characters or less, WHY Nestlé Ice Cream makes you smile. Hashtag your favourite charity or cause. Share it on your Facebook, Twitter, Instagram or Contest site. 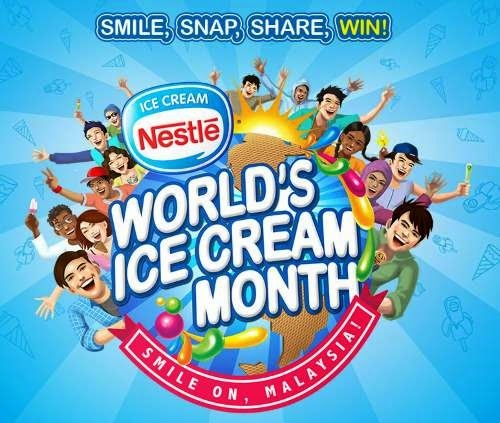 Visit Nestle World Ice-cream Month contest page for more details.